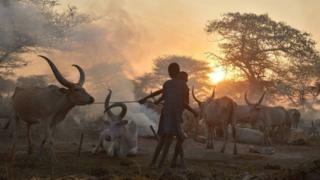 More than 170 people have died in the last week in clashes between two sub-clans in South Sudan, an MP has said. The violence in the Western Lakes region has also seen more than 200 people injured, local MP Dharuai Mabor Teny added. Despite clashes being relatively common, the toll from the latest outbreak is shocking, reports the BBC's Ferdinand Omondi from Nairobi. It has prompted President Salva Kiir to declare a state of emergency. The order affects three northern states, with military chiefs told to mobilise forces with enough equipment for up to three months. Mr Kiir also authorised the army to use force if armed civilians did not lay down their weapons peacefully. The violence involves armed youths from two rival Dinka sub-clans, who first clashed on 6 December. "Right now, from both sides, we have 170 plus people who lost their lives. 342 houses have been burnt and almost 1,800 people displaced," Mr Teny told Reuters news agency. A presidential spokesman said they hoped the state of emergency would help "curb the violence". It comes as the United Nations, which has deployed its own troops to help remove roadblocks put in by the two sides to enable trade to continue flowing, sends in a team on a five day mission to assess the human rights situation in the country. South Sudan, the world's newest state, became independent in 2011 after breaking away from Sudan. It has been hit by numerous ethnic and political conflicts since then. Mediation efforts by the African Union and foreign governments have failed to bring about peace.